It’s often said that those who forget the past are doomed to repeat it. It’s fitting then that, on the final day of the 2018 BC Federation of Labour Convention, that the final speakers of the day were Ken Novakowski from the BC Labour Heritage Centre, and Rod Mickleburgh, author of On the Line: A History of the British Columbia Labour Movement. Ken spoke about about work and importance of the work of the BC Labour Heritage Centre, including their video projects, their lesson plans for B.C. classrooms, their work with teachers, history walking tours, oral history program, remember working peoples’ plaque projects, the virtual exhibit for Solidarity which will be on the History Museum of Canada’s website. Rod talked the many stories in the book that touches on many different issues that we still deal with today, and about the history of the BCFED and how they have made the labour movement in B.C. the envy of the country. Collectively, their presence also served as a stark reminder that we cannot forget the work that progressives and those in the labour movement have done before us and we must ensure that, moving forward, we do not forget what was achieved at this year’s Convention and the importance of building upon our work and our stated goals and objectives. Friday may have been the final day of the Convention but there was plenty of work still left to do in the form of addressing as many of the submitted resolutions as possible before the conclusion of the event. Resolutions from the Education Committee that were carried included: Resolution 113 to cover 116 (operating grants for colleges/university system), Resolution 112 (tuition waiver to Indigenous students), and Resolution 114 (funding for adult education). Resolution 151 (reinstate Grant’s law) from the Young Workers Committee was carried. 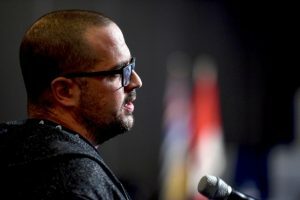 Among those speaking in favour of the resolution was Nathan Beausoleil, MoveUP union representative who is attending Convention as a delegated for United Steelworkers Local 2009. Resolutions from the Political Action Committee that were carried included: Resolution 143 (ongoing political action education), Resolution 139 (continued support for BC NDP/progressive legislation), Resolution (continued support to organizations that strengthen democracy in B.C. ), and Resolution 142 (demand government amend Local Government Act so municipal and school board employees are not required to resign their employ if successful in their respective municipal and school board elections). Resolutions from the Women’s Rights Committee that were carried included: Resolution 145A (accessible quality childcare) and Resolution 149 Amended (increase funding for transition houses and counselling for survivors). MoveUP Vice-President Christy Slusarenko spoke on Resolution 145A talking about how a fair, living wage needs to also be implemented for early childhood educators. Resolutions from the Community and Social Action Committee that were carried included: Resolution 82 (living wage), Resolution 83 (BCFED to become member of Union Protein Project), Resolution 84 Amended (housing-first policy), Resolution 80 (affordable housing strategy as part of sustainable poverty reduction program), and Resolution 77 (expand mandate of BC Housing). Resolution 83 was submitted by MoveUP, alongside IBEW 213, CUPE 1004 and USW 2017. Resolution 81 ($400 per year for all renters/increase subsidy in accordance to cost of living/increase quality of modular housing) and Resolution 76 (restrict non-resident ownership of residential property) were defeated. Resolutions from the Apprenticeship & Skills Training/Climate Change Working Groups that were carried included: Resolution 4 Amended (remain active on apprenticeship issues/increase provincial operating grants for trades training), Resolution 1 Amended (asbestos awareness), and Resolution 12 (marine and land bitumen spill response). MoveUP President David Black made a point of order to thank the staff of the BCFED – MoveUP members and Steelworker members – for all their hard work. Convention officially concluded with remarks from the new president, Laird Cronk, and secretary-treasurer, Sussanne Skidmore, final remarks from outgoing president Irene Lanzinger, an oath of office for the new representatives of the Indigenous Workers’ Caucus and, of course, the singing of Solidarity Forever. 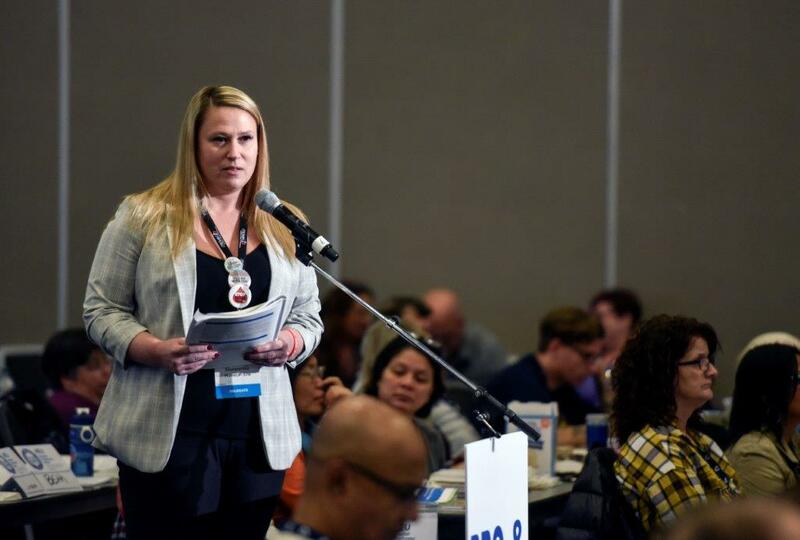 All reports as well as list of resolutions can be found on the BCFED’s Convention website here. 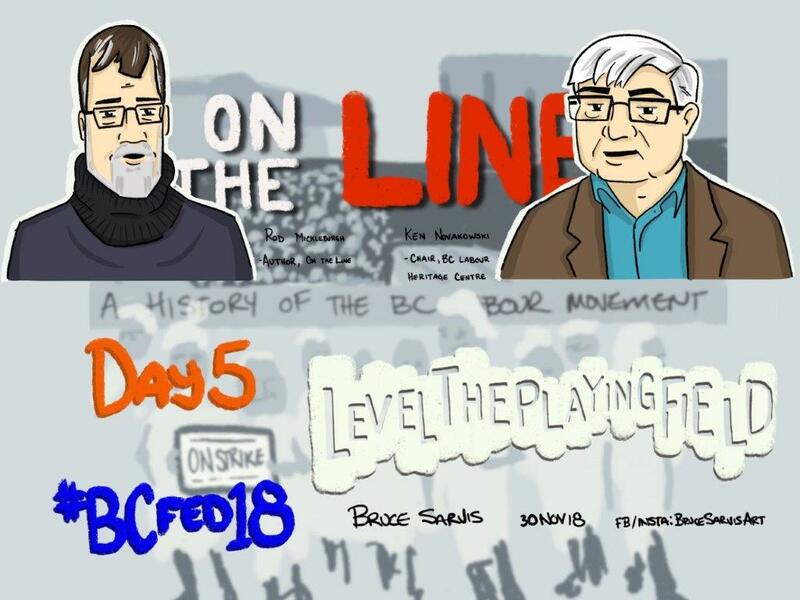 Click here for the Day 4 report from the 2018 BCFED Convention. Click here for the Day 3 report from the 2018 BCFED Convention. 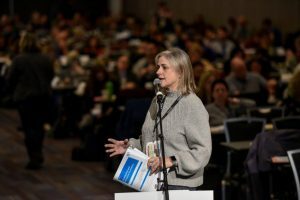 Click here for the Day 2 report from the 2018 BCFED Convention. Click here for the Day 1 report from the 2018 BCFED Convention.